Summary: Bracelet as one of the most common jewelry ornaments plays a very important role in reflecting your personality and taste. You can make yourself attractive by bracelet not only through its appearance or color but also through the way how you wear it. Bracelet as one of the most common jewelry ornaments plays a very important role in reflecting your personality and taste. You can make yourself attractive by bracelet not only through its appearance or color but also through the way how you wear it. Which kind of ways do you like to wear your bracelet? For me, I know two ways to wear bracelet. One is to wear it for single and the other is to wear it for several which is so called wrap bracelet. These two ways of wearing bracelet impact your bracelet adornment totally different. I’d like to wear wrap bracelet better. More stuff stacked together could give me a feeling of heaviness. What’s more important, wrap bracelet gives out multicolor more distinctive. We nbeads.com select out three kinds of wrap bracelet for you to have a clear acquaintance of wrap concept. 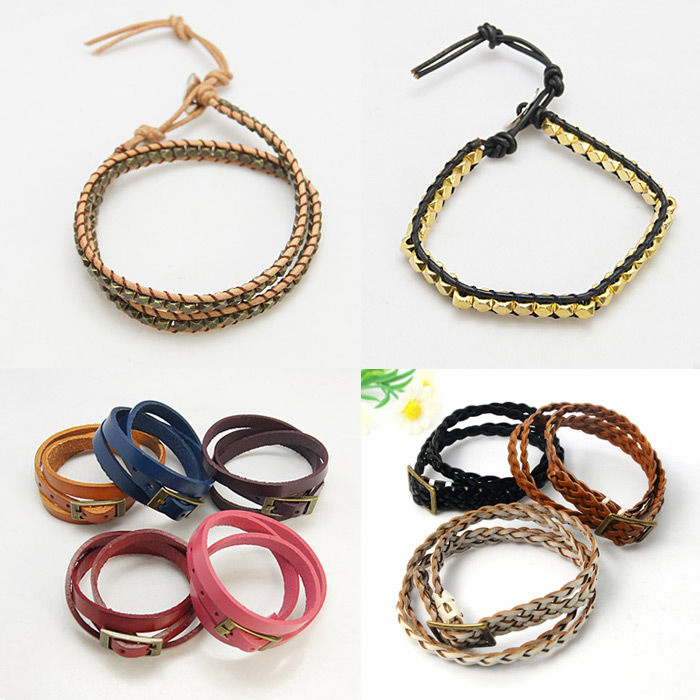 Comfortable leather wrap bracelets with unique design that very suitable for personality wear. It present out fashion and wonderful feeling. All are versatile for men and women. Leather could be inter-woven with thin cords or overlaid with wide cords, which are suitable for gift-giving or individual wearing. Captivating and distinctive! The most distinctive feature of glass wrap bracelets is that various glass beads in different shapes and colors are selectable to create unique. To design wrap style, other more types of beads like crimp beads and tube beads are encouraged to add color in your favor. Hematite has the lustre of metal. It is a kind of tough stone, and its obstinate shine let people handle things orderly and stoutly. It is the symbol of composure and personality and gives people a feeling of health and fashion. Wearing the magnetic hematite wrap bracelet make you more demure. It deserves your favor.